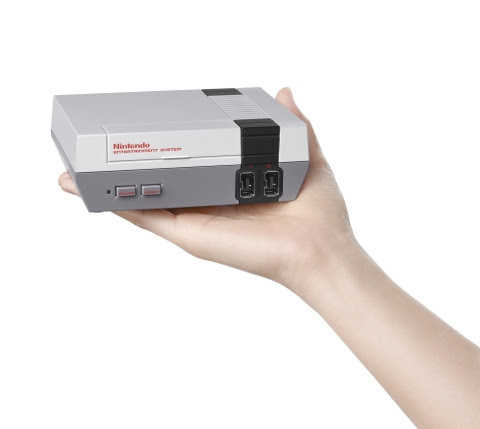 Nintendo Announces New Platform: NES Mini – 3WIREL! Remember the NES and the many great games that system had? Kirby’s Adventure and Mega Man 2 are games I remember really enjoying playing on my Wii, so classics on the NES hold up very well. Nintendo knows this, so they are releasing a new system this fall not unlike the SEGA Consoles that you sometimes see in stories bundled with a few games; Nintendo Entertainment System Mini. It comes with the system that has 30 games built-into the console, a NES controller that can work on the Wii & Wii U and a AC adapter that can also plug into USB ports (so you can power it without the adapter). The US is getting the adapter to plug into outlets but you need to get that by itself in the EU version of the system. More information about the console, including the bundled games, will be listed below in Nintendo’s official press release on the announcement. REDMOND, Wash.–(BUSINESS WIRE)– If you see a Nintendo Entertainment System on store shelves this holiday shopping season, you haven’t entered a time machine. (Unless everyone around you is wearing acid-washed jeans and neon leg warmers. If that’s the case, you may have unknowingly walked through a rift in the space-time continuum.) The most likely scenario is you are setting eyes on the Nintendo Entertainment System: NES Classic Edition, launching in stores on Nov. 11 at a suggested retail price of $59.99. That’s right: The NES is back! But this isn’t the same NES that you fondly remember. This new nostalgia-fueled system is a near-identical, mini replica of Nintendo’s original home console and plugs directly into your high-definition TV using an included HDMI cable. The console comes complete with 30 NES games built in, including beloved classics like Super Mario Bros., The Legend of Zelda, Metroid, Donkey Kong, PAC-MAN, and Kirby’s Adventure. This new nostalgia-fueled system is a near-identical, mini replica of Nintendo’s original home console and plugs directly into your high-definition TV using an included HDMI cable. There’s a little something for everyone: a nice mix of timeless favorites, cult classics and maybe even some games that you never got around to playing. Each is sure to bring back memories and produce plenty of new ones. You can even enjoy playing several of these games with two players by attaching a second NES Classic Controller, which will be sold separately at a suggested retail price of $9.99. A Classic Controller or Classic Controller Pro can also be used (each sold separately). When connected to a Wii Remote controller, the NES Classic Controller can also be used to play Virtual Console NES games on a Wii U or Wii system. Playing these retro games using a retro controller makes the experience that much more authentic. And if you ever need to step away from the NES Classic Edition in the middle of a tough level (or take a break to call one of Nintendo’s helpful Game Counselors*), don’t worry about losing any hard-earned progress. Each game has multiple suspend points, so you can start where you left off at a later time, no passwords needed. What’s old is new again with the Nintendo Entertainment System: NES Classic Edition. Relive past glories. Finish off that boss you never beat. Save the galaxy and rescue the princess! *Please only call if you have indeed entered a time machine. The Game Counselor program no longer exists in 2016. © KOEI TECMO GAMES CO., LTD. All rights reserved. © TAITO CORPORATION 1986, 2008 ALL RIGHTS RESERVED. About Nintendo: The worldwide pioneer in the creation of interactive entertainment, Nintendo Co., Ltd., of Kyoto, Japan, manufactures and markets hardware and software for its Wii U™ and Wii™ home consoles, and Nintendo 3DS™ and Nintendo DS™ families of portable systems. Since 1983, when it launched the Nintendo Entertainment System™, Nintendo has sold more than 4.4 billion video games and more than 693 million hardware units globally, including the current-generation Wii U, Nintendo 3DS and Nintendo 3DS XL, as well as the Game Boy™, Game Boy Advance, Nintendo DS, Nintendo DSi™ and Nintendo DSi XL™, Super NES™, Nintendo 64™, Nintendo GameCube™ and Wii systems. It has also created industry icons that have become well-known, household names such as Mario™, Donkey Kong™, Metroid™, Zelda™ and Pokémon™. A wholly owned subsidiary, Nintendo of America Inc., based in Redmond, Wash., serves as headquarters for Nintendo’s operations in the Western Hemisphere. For more information about Nintendo, please visit the company’s website at http://www.nintendo.com.